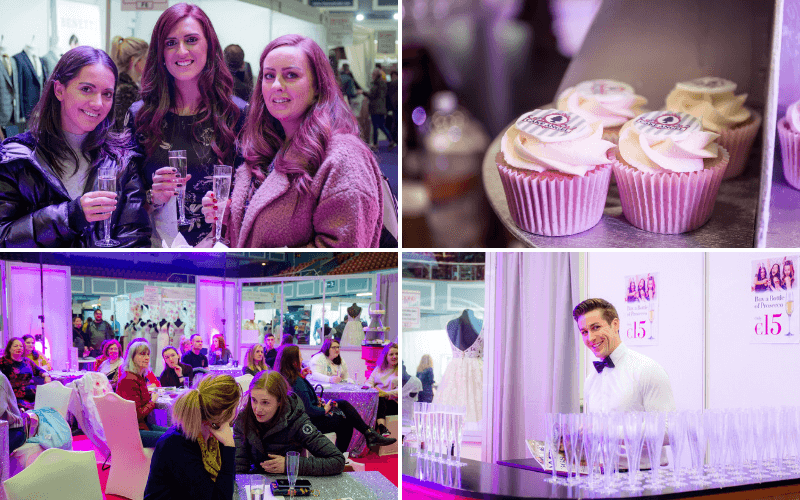 The Citywest Convention Centre was once again bursting at the seams with brides and grooms to be at our Spring 2019 Wedding Journal Show. We had everything – fashion, food, photography, venues, entertainment, even selfie mirrors and a portable bar all under one roof. 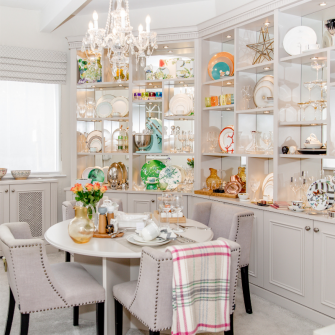 So join us as we take a look back at some of the highlights from this year’s Dublin show. Without a doubt the most talked about and captivating feature of the shows is our bridal catwalk. 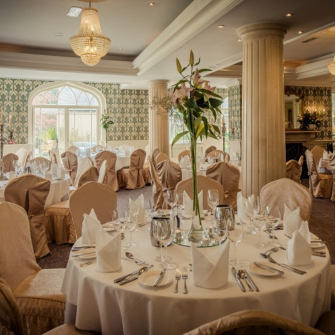 Each scene is a dramatic extravaganza brought to you by the very best bridal shops, manufacturers and designers available across Ireland. The latest styles to suits are all sizes graced the runway with looks for not just for brides, but for her maids, grooms and the all important MOB/G’s! 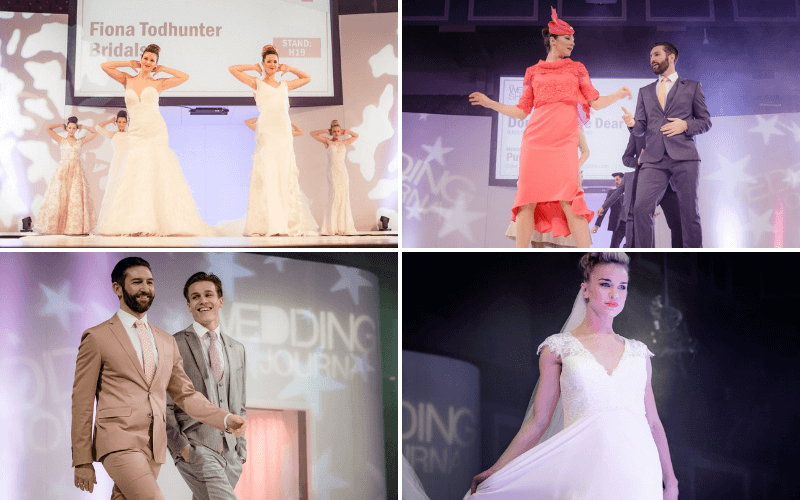 This year we were treated to looks from Remus Uomo, Guy Clothing, McElhinney’s, Fiona Todhunter Bridal, Diffney, Ciara Bridal and Dublin Bridal House. Another key highlight is finding out who walks away with the dream wedding worth €35,000 in Dublin. 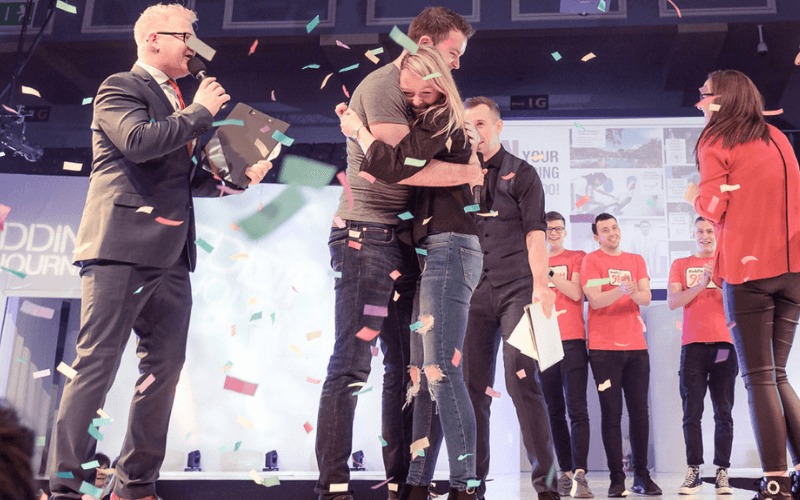 The atmosphere for our live final was electric, as this year we even had some couples plucked from the audience taking part. So many couples entered at the show and when the final came, thirteen of them were brought on stage. 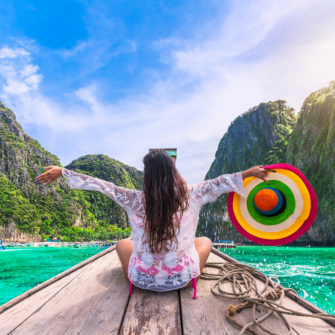 This year all thirteen couples were handed a ring box to which they had to ‘propose’ to their partner, but only four boxes contained a ring, these couples then had to dress their partner and the fastest two couples were put through. After much fun and games on stage with the team from 98FM, we had our winning couple. You’ll be able to find out more about our fabulous couple in the Summer issue of Ireland’s Wedding Journal, out in April. Hundreds of exhibitors came out to display their work for brides and grooms to see and gather ideas about. Ever helpful, they were able to answer any questions our brides and grooms had, showing their expertise in the industry. 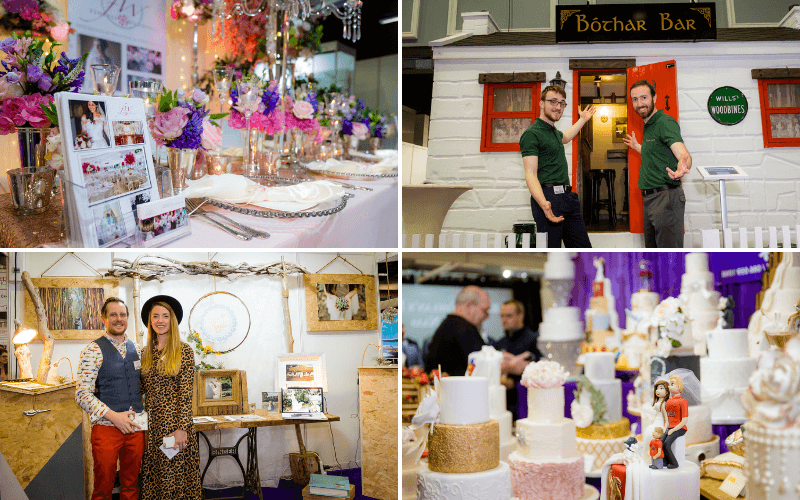 With our Honeymoon & Destination Wedding Pavilion, our Curious Wedding Zone and Inspirational Village there were lots of key areas to interest brides and grooms looking to add the finishing touches to their wedding planning at the show. There was an extensive range of exhibitors to suit all styles and tastes, from traditional to alternative and everything in between! Another delight were our on-stage entertainers! This year’s Dublin show featured The Hit Machine, Maria Fitzgerald and The Manouche Boys. 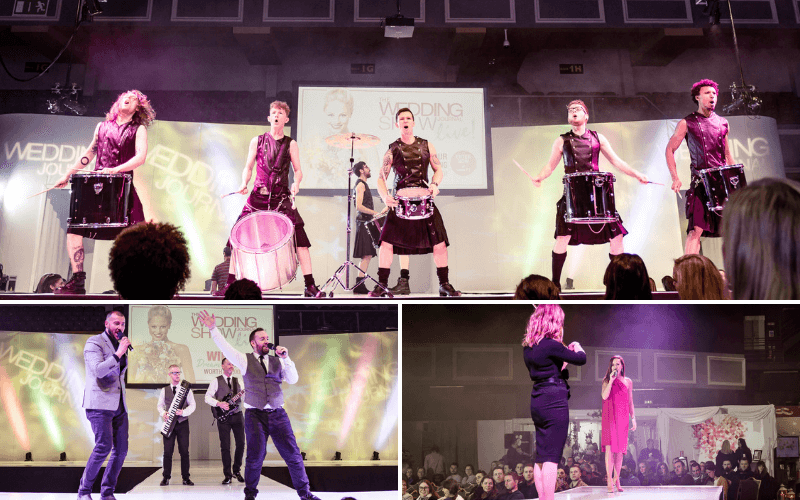 With the single beat of a drum, a stampede of couples fled to the stage for an exciting performance of drums, kilts and tap dancing, both a treat for the eyes and ears! Maria Fitzgerald took to the stage with her beautiful voice, singing two outstanding ballads accompanied by a classical violin. And of course to The Manouche Boys completed the line up with their own entertaining spin on George Ezra’s Shotgun. 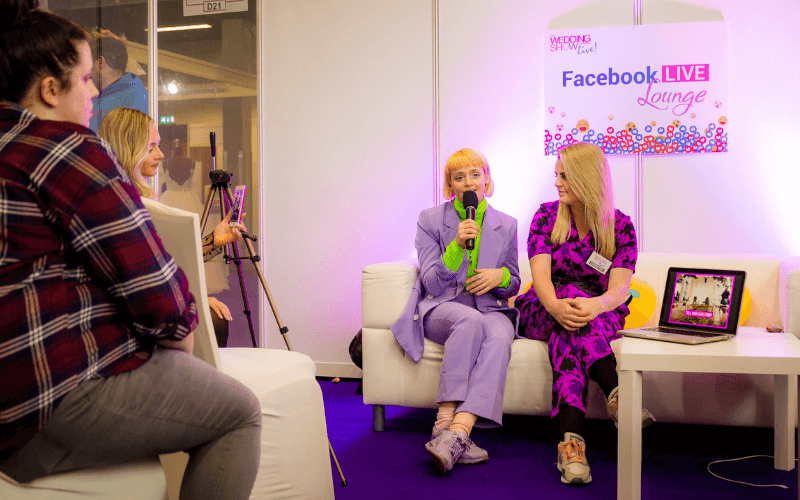 For those who couldn’t attend, we had a host of exciting exhibitors visit our Facebook Live Lounge for an interactive chat to the best in the business. The lounge was packed with busy brides asking lots of questions from beauty worries to honeymoon queries. 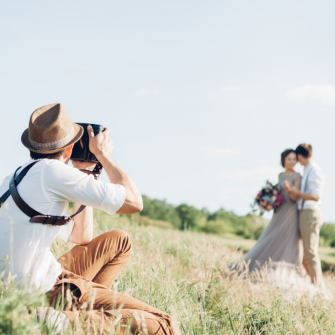 We had advice on hand from Ethiopian Airlines, beauty tips from Opatra London and Yon-Ka Ireland, photo tips from Jessica and Danilo Photography, venue styling from H&G Creations, styling from Bridal by Tamem Michael and of course, cake tips from Creative Cakes! Find them all here. The atmosphere in the VIP area was electric as couples and bridal parties eagerly made plans for their big day. 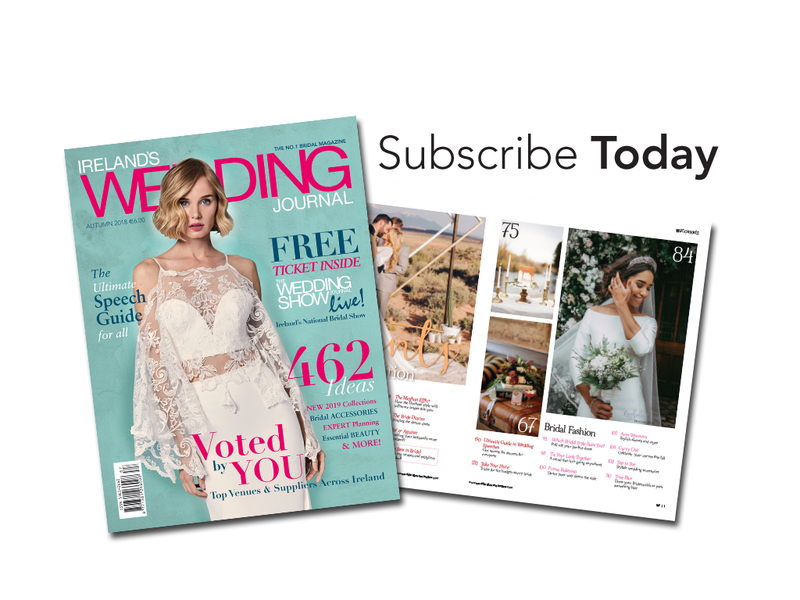 Our fabulous VIP ticket holders enjoyed an a class of bubbly, their exclusive goodie bag and cupcake courtesy of Zuko’s Bakery and Cake Angel, couples were able to rest a while and flick through our latest issue of Wedding Journal. The VIP lounge was also a great area to watch the fashion show and performers on the catwalk with reserved seating for VIP ticket holders. 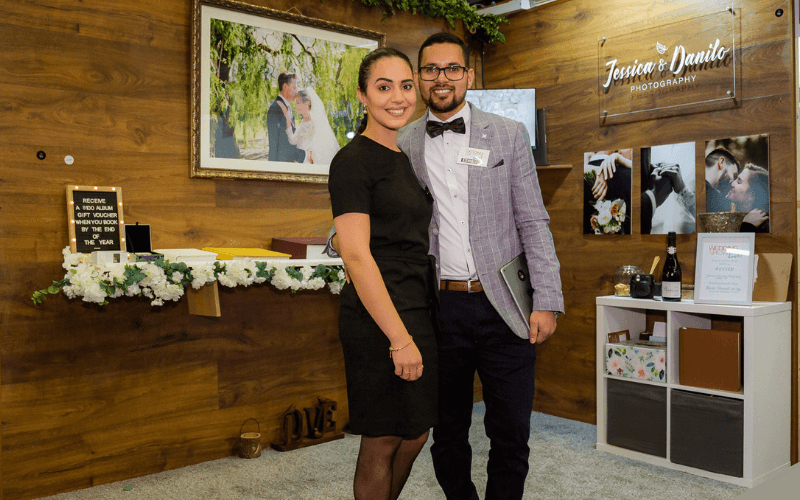 This year exhibitors pulled out all the stops and the stands were dressed better than ever but it was Jessica & Danilo Photography who pipped others to the post for their fun and exciting display. Congrats guys! We can’t wait to do it all again in February and meet more engaged couples planning their dream day. Tickets are still available – BOOK HERE!